It's all gone a bit crazy! If you saw the coverage of West Ham vs Wigan yesterday you'll understand why! From my point of view it was just another flight over a football match, one of four jobs on Sunday afternoon but the Millwall fans and the media have become excited enough to invite me to a match, kick it off as a Twitter 'trend' and start selling t-shirts! It's all in rather bizarre contrast to the local debate surrounding the future of Margate Football Club. So you have really helped relations between Millwall and West Ham fans with that banner. What do you do when it all kicks off between the 2 clubs. You really do not get football do you. By the way I do not support either of these clubs. I suspect that Millwall and West Ham can kick off quite well between themselves without my help! They have been for rather longer than I can remember. So Abu Hamza is innocent then? Does he play for West Ham or Millwall? You've lost me there?! I am a West Ham fan and I found it quite amusing. I am sure others will take it differently but you really can't legislate for their idiocy. Do you actually read the banners you trail behind your aircraft and consider the implications? The game was West Ham against Wigan and had nothing to do with Millwall. However bearing in mind past hostilities between the rival fans over the years (which I do not agree with) dont you think it was irresponible of you to take this particular job on? If not I would consider your morals are very poor. Oh really 11.03 get a sense of perspective! Where do morals come into it? After all, football fans do have a sense of humour - if you are a West Ham fan its mandatory! Well sense of humour seems in short supply here. After all, West Ham, located in an increasingly muslim East London, employed an Israeli manager. Touch of irony there! Whilst there has in the 'city firm' days been a bit of aggro between West Ham and Millwall suppporters, most of the banter is light hearted mickey taking. I am sure most people would see this banner as such and no more. Obviously someone on here has found just another excuse to kick the Tory and it has nothing to do with concern for law and order at all. Depressed Charlton Fan - did you miss the violence in August 2009 (less than 2 years ago)? If you did suggest you check out the BBC news http://news.bbc.co.uk/1/hi/8221451.stm. You can hardly call that light hearted mickey taking can you? Violent elements clearly still exist amongst both sets of supporters so fanning the flames may not be seen as mere banter by all. The two teams will certainly be facing each other twice next season, so perhaps Dr Moores should take up the invitation to attend one of those games - but then I'm sure he'll be nicely ensconced within the corporate hospitality area away from the riff-raff element! If a message is overtly offensive and may be perceived as incitement, then i don't take it. Strangely enough, i have a good relationship with police where such matters are concerned and like tomorrow's job, actually liaise with them first for approval. To commemorate another action packed season the Premier League have produced a limited quantity of Special Edition toolkits - no hammers included. I particularly liked the comment shown below on the Margate fans forum, alongside the "His days as a councillor are numbered" bit. Strangely enough I didn't do the Preston banner; it was a partner company based at Blackpool instead. But keep trying gentlemen, I enjoy the banter and while clearly Margate fans don't appreciate my work, Liverpool, Man United, Man City, Millwall, Southampton, Norwich and many other clubs quite often do !! Did anyone hear Cllr Moores being interviewed on TalkSport on Monday afternoon concerning his company Air Ads. He took an order from some Millwall Fans to fly a banner over the Wigan Stadium after Sundays game where West Ham United were relegated saying ' Avram Grant a Millwall Legend'. Surely this was irresponsible as this could have inflamed trouble with the West Ham fans who must have been hurting at this point plus the scenes shown on Sky Sports News after the game showed some very angry West Ham fans confronting the Wigan Stewards. I would have thought the police would have something to say about this. His company did a similar thing to when Blackpool fans paid for a banner to fly over the Preston fans when they were relegated and Preston boss Phil Brown commented that 'if he had a gun he would have shot it down'. Again this is done by people who know nothing about the emotion of the game of football. The antics of some of our Cillrs makes you feel proud !!!! See this stunt is being investigated by the CAA now. As long as the pilot maintains correct distance, altitude and obeys the land clear rule, there is no case to answer and as of this time, the CAA haven't made any contact. The Daily Mail is inclined t be a little extravagent in its reporting! Oh shut up you bunch of whining muppets. It was a laugh. Everyone was laughing at them anyway, we just did it even better. Surely you have something better to do than moan at Simon? Like polishing your best complaining pen or something. He is supplying a service - he is not the thought police, nothing was illegal, nothing was offensive, nothing was aggressive. Do you really think that if it kicks of between us and West Ham it will be because of the banner? And you say that Simon doesn't go to football! Mugs. "The Daily Mail is inclined to be a little extravagent in its reporting!" - understatement of the week? 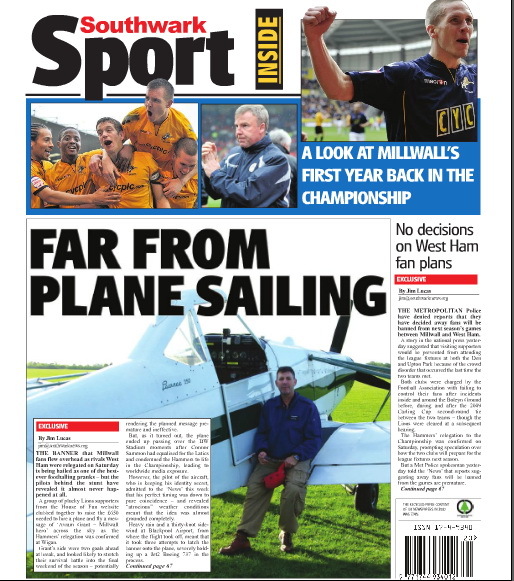 You made a lot of Millwall fans very happy with that flight and even the West Ham fans saw the funny side - so take no notice of the jobsworthies on here. I thought it was proper funny. West Ham took it on the chin and found it funny, and Millwall had a good laugh with it. Anyone that thinks anything different is a damn fool. 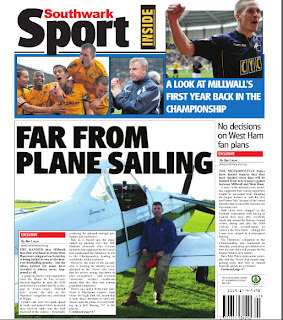 The pilot of the plane that towed the banner is pretty chuffed with himself http://birchington.blogspot.com/2011/05/millwall-legend.html. He' s a local councillor who has made himself pretty unpopular with football fans in Margate as he is seen as the local tory council member who has gone out of his way to prevent Margate FC from going ahead with ground developments to raise revenue as the club try to get back to the Conference. Damnit Mr. Moores can you not see what you have done!? Your stunt was no doubt the reason for the violence in 2009 and all violence preceding that, nevermind that the last time these 2 teams were in the league together there wasnt much trouble at all because the police did their job properly and listened to the clubs. Not only that but you also ended up ruining the west ham end of season dinner! I hear a brawl started after someone said they enjoyed your banner... Disgraceful. Naturally I'm mortified and you'll note that I flew a banner proposal over Brighton beach this afternoon and thousands of sun worshippers were properly shocked by the marriage proposal behind it. Of course, at the other end of the island, another banner flew over Celtic and I'm sure they were outraged too! I almost forgot,there was David Cameron a couple of weeks ago, organised of course by No10 and the Home Secretary on Thursday, who escaped a police sponsored banner because of bad weather at Bournemouth. It's a business and a highly specialised one too with only a handful of pilots able to do the job. Occasionally, it's a kind of Mission Impossible existence but I'm careful not to take assignments that are overtly offensive but we do everything from the FA Cup final to the Big Brother House. This is the first time I've seen such an unusual response to a football banner in many years. ps A Westham fan at work stood me a lunch time pint the Monday after the weekend of the flight and as he said " that was classic"